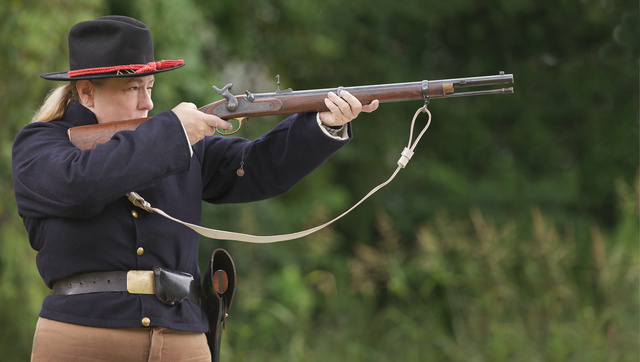 This entry was posted in interesting people, rifle, weapon and tagged black powder, bluebelly, reenactor, Yankee. Bookmark the permalink. Well, they’ll break whatever they’re issued anyway, so why waste the good stuff? Same reason they get PBR and Coors while I drink single malt. They’d just break them anyway. They’d just break it anyway. Done joined up with them federals, eh? The Wikiarticle does list it as used in both U.S.A. and C.S.A. Actually, it’s not an SBR. Muzzleloading replica aside, the barrel length is 24 inches. You save a lot of length using advanced caseless ammunition. I named it so in jest. It’s definitely short relative to the proper rifle…I’ll post photos of the two side by side. Should be labeled PDW. This falls into perspective when your main gun is a howitzer.